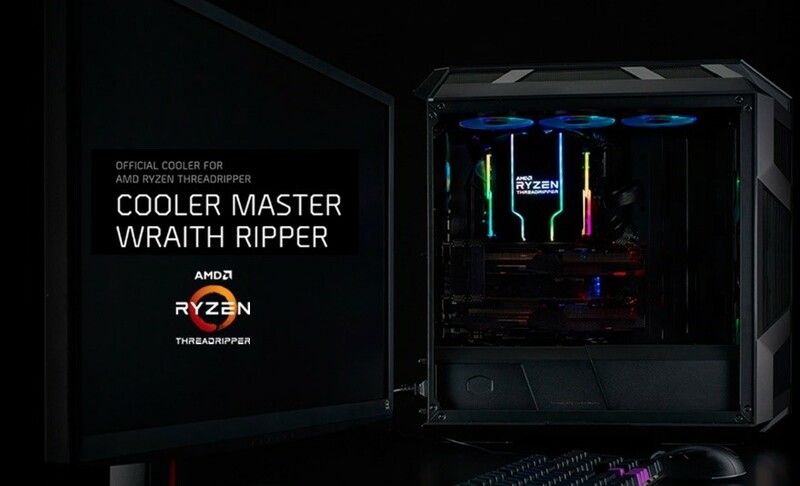 SINGAPORE – Cooler Master, a global leader in computer hardware and peripherals manufacturing, announces the Wraith Ripper, the official air cooler for the 2nd Generation AMD Ryzen™ Threadripper™ processor, as part of an exclusive partnership with AMD. The Wraith Ripper is designed, specifically, to keep the 2nd Generation AMD Ryzen Threadripper cool under the most strenuous conditions and manage up to 250W TDP. With content creators, developers and PC enthusiasts in mind, the Wraith Ripper is designed with dual tower heatsinks, a seven heatpipe array for advanced thermal conductivity and a large contact surface area optimized for the Ryzen Threadripper. Concealed under a specialized Wraith Armor, designed to help guide airflow, is a 120mm Servo fan. Mounted between the dual tower heatsinks. The Wraith Ripper’s sleek, black design is complimented by the simple dual Addressable RGB strips that highlight the cooler and frame the backlit ARGB AMD Ryzen Threadripper logo on the top. Users can customize the speed, color and lighting mode of each LED through the built-in lighting control. To achieve full lighting control, users will need to download the Wraith Ripper lighting software, available on the product microsite. The Wraith Ripper is now available in Singapore, priced at SGD 199.